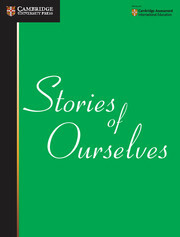 This series contains poetry and prose anthologies composed of writers from across the English-speaking world. 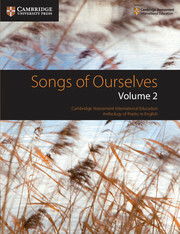 Parts of Songs of Ourselves Volume 2 are set for study in Cambridge IGCSE®, O Level and Cambridge International AS & A Level Literature in English syllabuses. 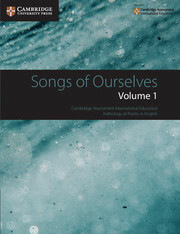 Following on from the popular Songs of Ourselves 1, the anthology includes work from over 100 poets, combining famous names – such as William Blake, Emily Dickinson and Les Murray – with lesser-known voices. This helps students to create fresh and interesting contrasts as they explore themes that range from nature to war. 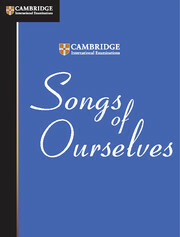 Parts of the book are set for study in Cambridge's IGCSE, O Level, and Cambridge International AS and A Level Literature in English syllabuses, but it is designed to have a broader appeal and function, providing verse to enjoy for readers of all ages and backgrounds. 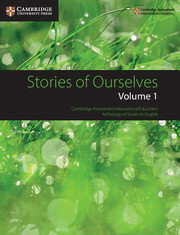 Like the first volume, it contains work by more than 100 poets from all parts of the English speaking world. Famous poets, from William Blake to Les Murray, are once again mixed with many new and lesser known voices to create fresh and interesting effects and contrasts. Poems have been carefully chosen for their universal appeal, avoiding anything very obscure or hard to interpret. 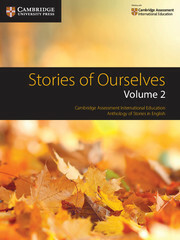 The poems are arranged in broad thematic sections, allowing many different connections to be made, which will stir readers' interests, inspiring them to explore the rich and ever expanding world of poetry in English. Brief notes under the poems help with difficult words, phrases and references. 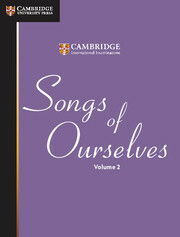 Can be used alongside Songs of Ourselves Volume 1 and Stories of Ourselves Volumes 1 and 2.